I’ve been wanting to share a cauliflower steak for the longest time, and my beloved version is finally here! If you’ve never had cauliflower “steak,” it’s exactly what it sounds like: cauliflower sliced lengthwise into “steaks,” seasoned, and either grilled or roasted (I went for roasted) until tender on the inside and crispy on the outside. Swoon! 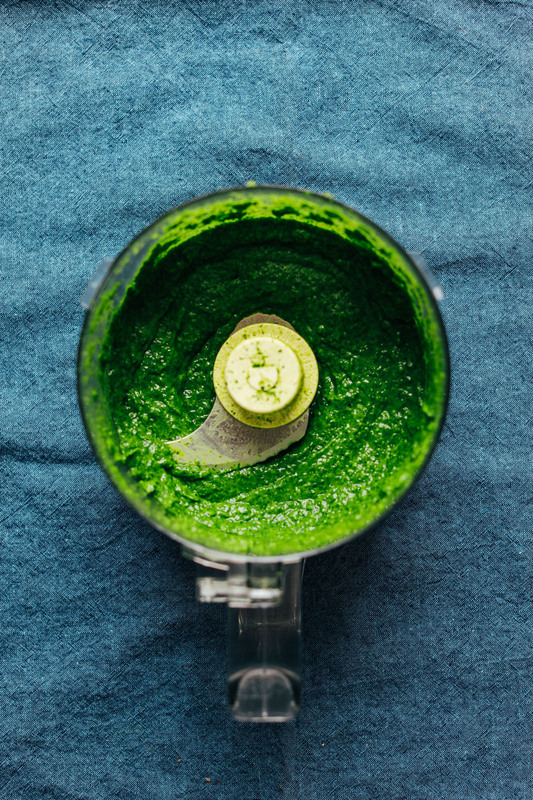 My take is simple, requiring just 30 minutes and 10 ingredients to prepare, which includes my go-to green chutney sauce! 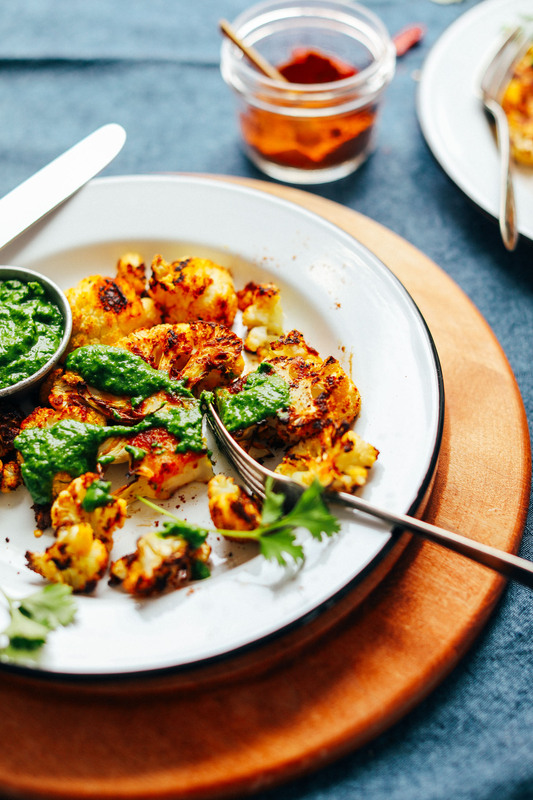 For seasoning the cauliflower, I went with my DIY Shawarma Spice Blend, which creates a smoky, subtly spicy coating that pairs perfectly with the chutney. I love this either as a hearty side or served atop a bed of quinoa for more protein (see recipe + notes for more options!)! It could also pair especially well with my Mediterranean Baked Sweet Potatoes, Garlicky Kale Salad with Crispy Chickpeas, Curried Butternut Squash Soup, or Chickpea Shawarma Dip! 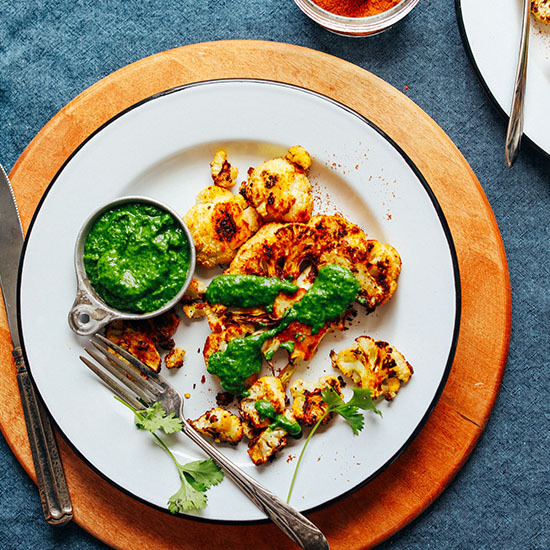 Hearty, 30-minute cauliflower steak seasoned with a smoky shawarma spices blend, roasted until tender with a crust, and served with chutney! *Use your leftover chutney on my Samosa Potato Cakes and Vegetable Pakoras! Does the nutritional information include the half a avacado? Hi Amanda, no, it does not. We calculate our nutritional info without optional ingredients (unless otherwise specified). Hope that helps! This was just fantastic – we made it exactly as per the recipe, including the coriander sauce (as we’d call it in the UK), and it was great. We used it as a side dish to chicken strips, which we dusted with the shawarma rub, and griddled. We also had blackened red peppers and tomatoes, and home-made pitta bread. Wish I could upload a picture! Hi Caro, that sounds lovely! Thanks for the review. For future reference, feel free to take a picture and post to instagram with the hashtag #minimalistbaker! I made this tonight and was delighted – it is so delicious! 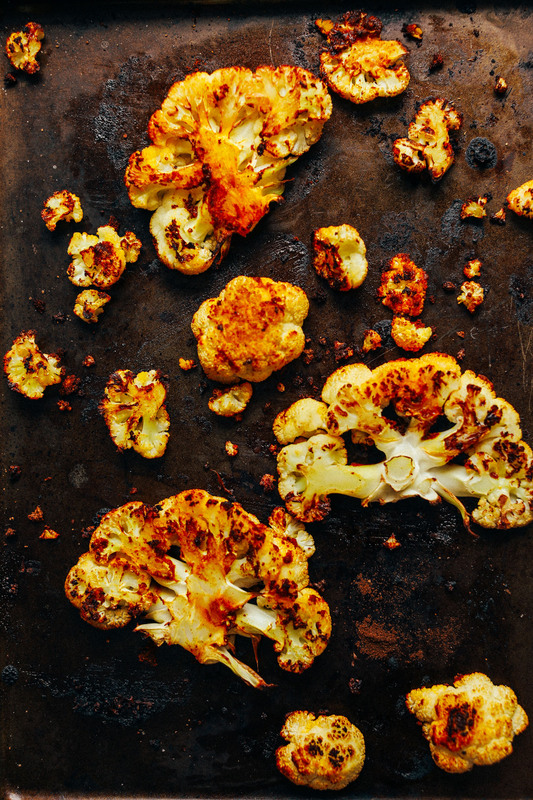 The cauliflower is full of subtle flavours from the shawarma spice and the oven roasting, and the sauce is an absolute joy that zings brightly across it. I used a bit more avocado and left the sauce quite thick – which I really enjoyed. The taste was good but make no mistake – this is a single persons meal. I chased myself out of a room more than once and it lasted all night long – what’s worse is that I’m not single so it was double the phew. SOOOOO good!! I served this on a bed of your Roasted Jalapeno Hummus then besides the chutney (made with parsley vs. cilantro), I also drizzled with some of your Romesco sauce. Gorgeous presentation and SO amazing! The only change when I make it next time is much less maple syrup on the cauliflower; we felt it did not need the sweet. Thank you SO very much for making healthy eating a delight! Whoop! We’re so glad you hear that, Shane! I have to say that this was one of the most delicious cauliflower recipes I have ever made! It was super easy, the perfect blend of sweet and salt+spice….the only part I was confused with was once I turn the steaks over, do I add more maple syrup and spices or leave alone. I decided to season both sides and it was the right answer. Also, instead of avocado for the sauce, I used a wee bit of vegan coconut yoghurt. I used a Vitamix for the cilantro sauce and think it would have been better in the cuisinart as it was too liquidy. A chunkier sauce would have been preferable, but the taste was divine regardless. Finally, I served this with Persian sour cherry rice. YUM YUM!!!! Hi! Is this a really spicy dish? We have 2 in our family of 5 that can’t do Spicey. Any suggestions on how to make it mild but flavorful. Thanks! Hi Cindy! It is very subtly spicy but feel free to adjust the spice blend to your liking (I’d cut down the cayenne and paprika if you’d prefer low spice). Hope this helps! This recipe sounds great! Is it possible to air fry the cauliflower instead of bake? And I’m not a big schawarma fan, so can I put any sort of seasons on here? Hmm we haven’t tried, Bethany! The seasoning is flexible and you can add any of your favorites. Good luck! I made this tonight and loved it. I used basil instead of cilantro and half an avocado. I think next time I will triple the sauce–it was that good! Thank you. I just made this for lunch today. I followed the sugar free option, and added the suggested 1/2 avocado to the chutney. It was SO GOOD. I’m looking forward to having it again tomorrow, and I will definitely be making it again! Thanks! How long will the chutney last? Can I make it the day before? Delicious! My husband is not a big cauliflower eater and he loved this recipe. It will be my go-to recipe for cauliflower and whenever I need to make a side dish for us or for a party. Glad to hear it, Lesley! The “chutney” sounds good, but is more like a chimichurri. Any recommendations on how to get the cauliflower sliced into steaks without crumbling? Hi! The larger the cauliflower, the easier it will be to cut into steaks. Hold the cauliflower with its base on a cutting board, and using a sharp knife, make one cut through the center of the cauliflower to cut in half. With each half, cut 1-inch thick slices, leaving the stem on to hold it together. Hope this helps! I saw one recipe that said to cut the cauliflower in half. Then it wouldn’t be a steak and you couldn’t flip it but it might all hold together. I’ve made this a few times now and love it! Tons of flavor and just really satisfying. The shawarma spice blend is awesome to have on hand in the kitchen too. Wow! the Chutney is fabulous.. Making the Shawarma Steaks tonight..if the are half as good as the Chutney they will be amazing! This recipe is a keeper! Followed exactly as is and served over brown basmati rice. My fiancé and I both loved the flavor of the shawarma spices and chutney together. Very delicious. Can’t wait to make it again! Made this tonight minus the chutney as I didn’t have those ingredients and I thought it was good. I think if I make this again, I will omit the maple syrup, I thought it was too sweet. This sounds and looks amazing!!!! 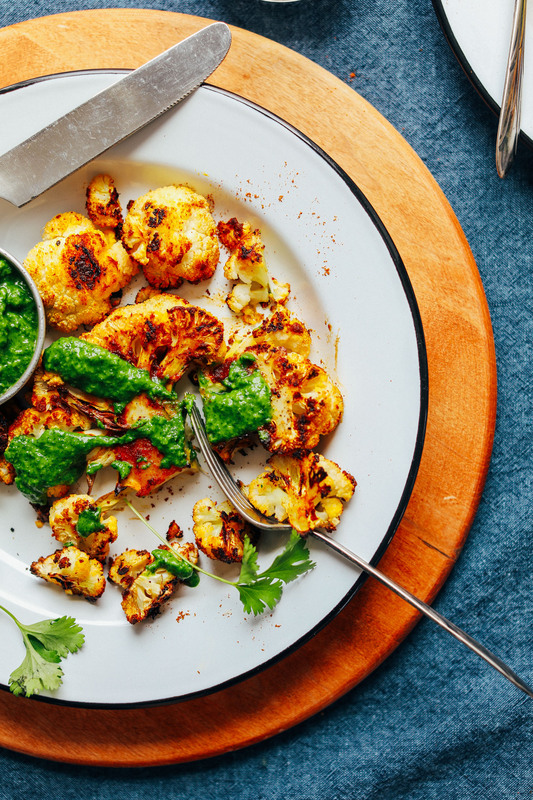 I can’t believe I’m saying this as a life-long cilantro hater, but I made this and loved the chutney! My family of 5 went vegan two years ago and it wouldn’t have been possible without this website. I do all the cooking in the house and use your recipes for 4 dinners per week (on average). Thank you! I hate cilantro too and was scrolling over the comments to see if someone suggested a substitution for the chutney, but after seeing this I’m going to give it a whirl! I rely on Dana’s recipes at least 3 nights a week if not more too after going vegan a year ago. I made this for dinner last night with the mediterranean sweet potatoes and it was amazing! Highly recommend this for a quick and hearty dinner. Minimalist Baker is the absolute best! Hi Dana! Would subbing basil for cilantro work for the chutney? Hi Emma! We haven’t tried it but it should work! It works, I’ve just mixed both and it tastes nice! The “Naked Lunch” makes a version of this that is delicious!! (restaurant at Moms Organic) I will try to slice this or ask the restaurant how they get the slices to work. You have turned me onto so many things; this is going to be next meal to try. I wish you could deliver this too. Totally! You need a pretty big cauliflower to make this work. And florets work the same! I’m obsessed with Shawarma right now bring it on! 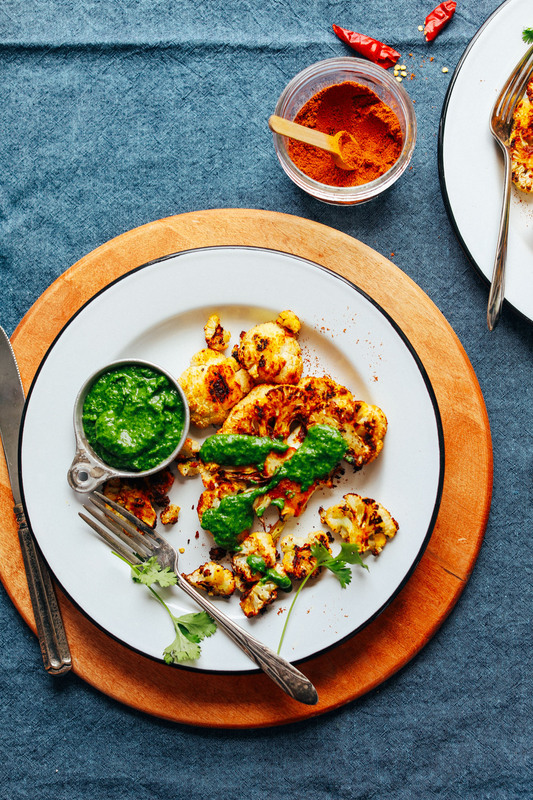 Love the idea of a cauliflower steak.. love that you paired it with an incredible looking chutney! Can’t wait to try this out!